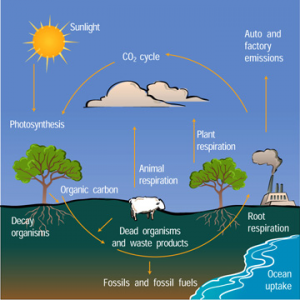 Most of us are familiar with the carbon cycle, which is good because we depend on it for life. To put it simply, animals exhale carbon dioxide, and decomposing animals release carbon, while plants take in CO₂ during photosynthesis. The carbon cycle does require that some CO₂ be released into the atmosphere, but currently, anthropogenic (human-generated) activities are taking care of this to the extreme. Many are aware of carbon dioxide’s contributions to global warming and the changes it is bringing to the sea levels, droughts, and seasonal storms, but few follow and understand the full effect of global warming through the whole carbon cycle- which often ends up in the ocean. Contrary to public awareness, carbon cycling doesn’t stop in the atmosphere. All the extra carbon in the atmosphere ultimately gets absorbed by the ocean. Ironically, scientists at first thought this was a good thing. They knew too much carbon in the atmosphere was a problem, so they were thrilled to find out that the ocean mitigate global warming effects by absorbing some of it. However, upon further investigation, they realized having extra CO₂ in the water meant drastic changes in the chemistry of the ocean and thus the health of marine life. Many organisms have evolved to live in specific types of environments. They have livable ranges for conditions such as temperature, amount of light, pH, and nutrient density. However, for some organisms, even slight adjustments can be detrimental to their health and survival. For example, ocean acidification is changing the environments many marine organisms were accustomed to. When gaseous CO2 mixes with water, carbonic acid is created. The free-floating hydrogen ions released from this reaction have two known devastating effects: they can either decrease the pH or they can bond with carbonate. “Power of Hydrogen”, otherwise known as pH, is a logarithmic measurement of the concentration of H⁺ ions. Increasing the concentration of H⁺ ions (such as those released from the carbonic acid reaction) decreases the pH of the ocean (which makes it more acidic). The pH scale is logarithmic; changing the pH by something as “small” as 0.1 or 0.05 has a ten-fold effect— a much greater effect than the numbers lead one to believe. These “small” changes in the pH of the ocean have big, harmful effects on organisms. Studies have shown that in waters with high concentrations of CO2, fish can become confused, hyperactive, and have a difficult time recognizing predators. Released H⁺ ions can also bind to carbonate (CO₃ 2⁻), therefore creating bicarbonate (H₂CO₃). This is damaging because normally carbonate binds with calcium to create calcium carbonate— the same polymer that shellfish use to build their shells. When the H⁺ ion sequesters carbonate, shellfish can no longer build their shells, resulting in deformed shells or even death. As we continue to put CO2 into the atmosphere (and consequently the ocean) the pH will decrease even more, sending more marine life out of its preferred pH range. Ocean acidification was not seen as a major problem until the late twentieth century. 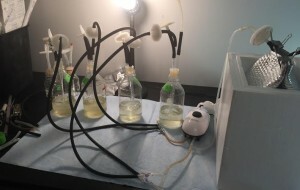 Since then, scientists and researchers have run a myriad of experiments testing various organisms in different environments, such as high CO2 and high temperature. They go to places as hot as Hawaii and as cold as Antarctica to study carbon cycles and algae blooms. One of the most prominent organisms in all these environments is the diatom. Diatoms have become a model organism when studying ocean acidification because they actually thrive in high CO2 environments. Diatoms are unicellular, photosynthesizing algae found almost any place where there is water. One thing that makes them special is that they have silica (glass) cell walls. In order to predict future effects on the rest of the ecosystem from ocean acidification, scientists study diatoms in waters with predicted future high levels of CO2. Diatoms also play a significant role in climate change- and potentially decreasing its effects. When diatoms photosynthesize, they release oxygen and take in CO2, thereby reducing the amount of CO2 in the atmosphere. In fact, diatoms are responsible for producing almost a quarter of the world’s oxygen! Finally, diatoms make up the basis of the oceanic food chain, providing food for small plankton, which fish and other larger organisms feed on. Ocean acidification not only harms marine life, it also poses a threat to our economy. Changes to organisms at the bottom of the food chain, such as diatoms, plankton, and small fish, have effects traced all the way through to the top of the food chain. The Pacific Northwest is currently in the first stages of this. Known for their fresh seafood and shellfish, Pacific Northwest farmers are one of the main suppliers of oysters shipped to restaurants and grocery stores all over the country. However, in the early 2000s, oyster hatcheries began to see many of their oyster larvae die. Puzzled, farmers ran tests and found that the high acidity in the water was preventing thousands of oyster larvae from developing. Not only is this bad for oysters, it is also detrimental to the local family business and their employees that run the oyster hatcheries and farms. Research by Northern Economics for the Pacific Shellfish Institute  found that in 2010 in the state of Washington, shellfish farmers were responsible for a total of $77.1 million in labor income. Ocean acidification is clearly a huge problem with potential severe impacts on humans, yet still many people are unaware of the seriousness of it. At ISB, one of their institutional goals is to share findings from scientific research with the public and make it accessible and understandable to kids. The Baliga Lab has created curriculum about ocean acidification, but it is still not a strong, standard unit in all general biology courses. Developing interesting, hands-on curriculum keeps kids interested and excited about learning ocean acidification. Scientists run lots of experiments on diatoms but usually in a sophisticated lab setting. So how can you really bring this experience to high schools? This summer, I worked to develop procedures similar to those that researchers use, but are feasible in a classroom, keeping in mind the equipment and resources available to teachers. For example, to create systems with high CO2, representative of future oceanic conditions, scientists use CO2 that comes from the wall. For a classroom, I tested if dry ice would be a viable source of CO2. 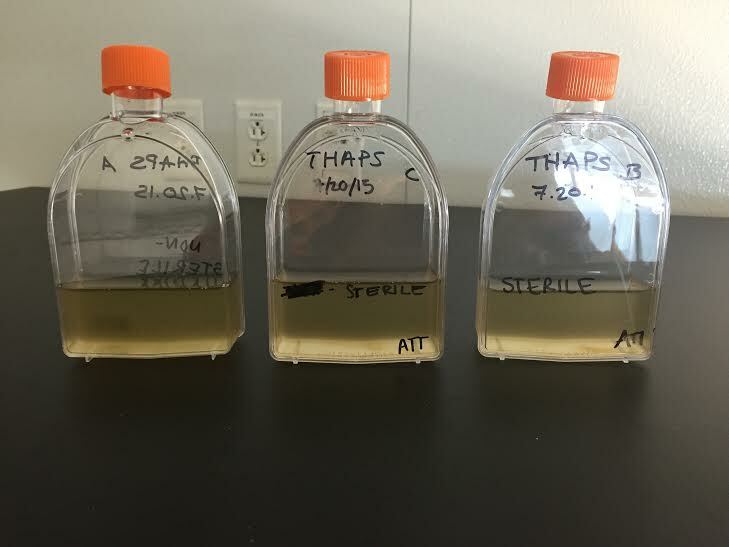 Four bottles were inoculated with media and Thalassiosira pseudonana, a widely studied species of diatom. 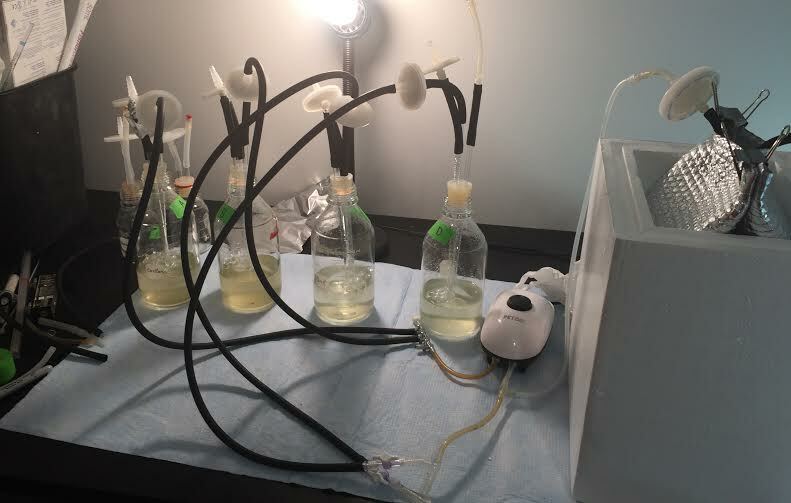 Two of the bottles received air circulating in the room pushed from an air pump through filters, and two of them received a mixture of air from the room and additional CO2 from dry ice pushed from an air pump through filters. We found that dry ice does release a measurable amount of CO2, as seen in the changes in pH. The two bottles that received a mixture of air and CO2 from the dry ice had a significantly lower pH (about 6.5) than the other bottles that only received air from the room (their pH was about 8.4). However, the dry ice proved to be problematic because it evaporated very quickly. Placing it inside a cooler slowed the evaporation significantly. Using a larger beaker and filling it with more dry ice could also extend the period of time CO2 is released. Even with these modifications, the experiment could only run for about five days as the dry ice would likely evaporate over the weekend. However, inoculating with a high number of cells, and growing them on an expedited, 24 hour light cycle, would likely show enough data to get conclusive results. Next, when sampling, common measurements include pH, photosynthetic efficiency, and cell counts. In the lab, scientists often use an m_cresol purple dye to measure the pH and a chemical called DMCU to measure photosynthetic efficiency (a measurement of how much light energy is converted to chemical energy- an indicator of how healthy the cells are). These tests require an expensive, fancy machine that measures both fluorescence and absorbance. To avoid this, pH test strips, supplies commonly found in classrooms, could be used. While a pH test strip doesn’t give as precise a measurement as the dye, we found that the difference in pH between the two systems was large enough to be able to see a difference in color on the pH strip, which would show high levels of carbon dioxide. Next, instead of using DCMU, FluorPens or AquaPens are relatively new, portable devices used to measure chlorophyll fluorescence, a measurement of photosynthetic efficiency that indicates how healthy the cells are. There are alternatives to fancy lab equipment that is practicable for classrooms, yet still gives similar results. Ocean acidification is becoming an increasingly pressing problem. If nothing is done to predict the effects, and keep it from becoming worse, there will be drastic negative effects to ecosystems and our economy. And while there is some curriculum regarding ocean acidification, it is not widespread into all classrooms. By educating youth, knowledge and urgency will be spread that can hopefully give insight into solving global climate change problems.